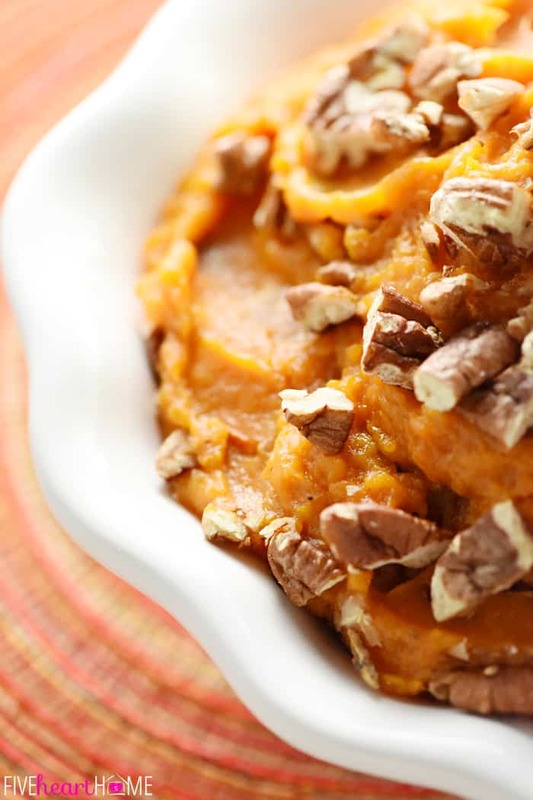 Slow Cooker Sweet Potato Casserole is creamy, delicious, and topped with toasted pecans for a crock pot Thanksgiving side dish that also frees up oven space! 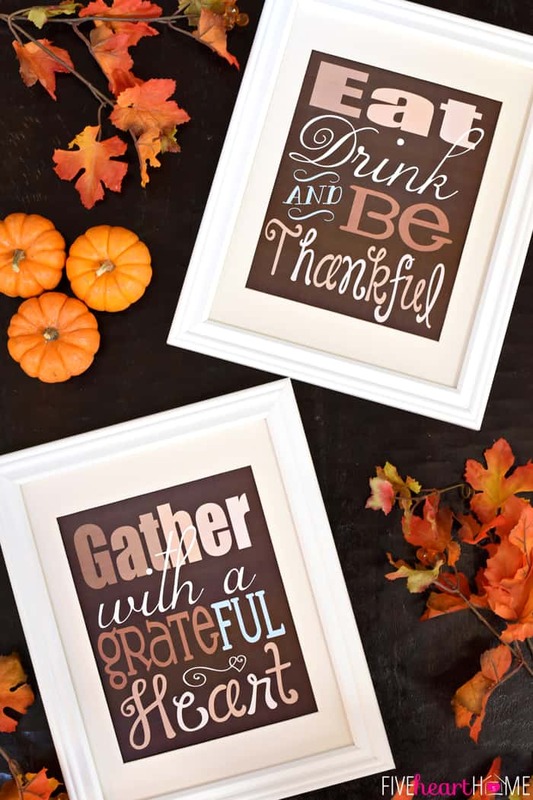 Well, November is already flying by at record pace, so I do believe it’s time to start getting serious about Thanksgiving menu planning. 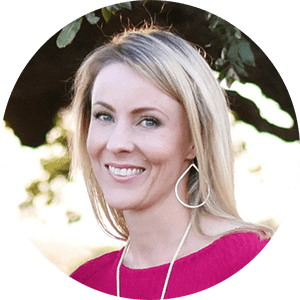 Do you already have a set-in-stone menu that you adhere to each year, or do you like trying new recipes? 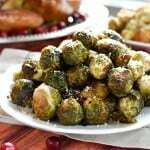 Orrrr do you make mostly “family tradition” recipes while throwing in a few new options every holiday? I have to say that I’m in the latter camp. I always prepare the same turkey and green bean and corn recipes. I try different spins on dinner rolls. I faithfully bake pies (and typically start ’em with my Fool-Proof Flaky Butter Pie Crust), but I might change up the varieties or specific recipes. And I always make sweet potatoes, but sometime I prepare them candied or baked and sometimes they’re turned into a casserole…sometimes they’re topped with pecan praline and sometimes it’s toasted marshmallows. Well, this year, I decided to try yet another sweet potato approach…throwing together my recipe in the slow cooker! 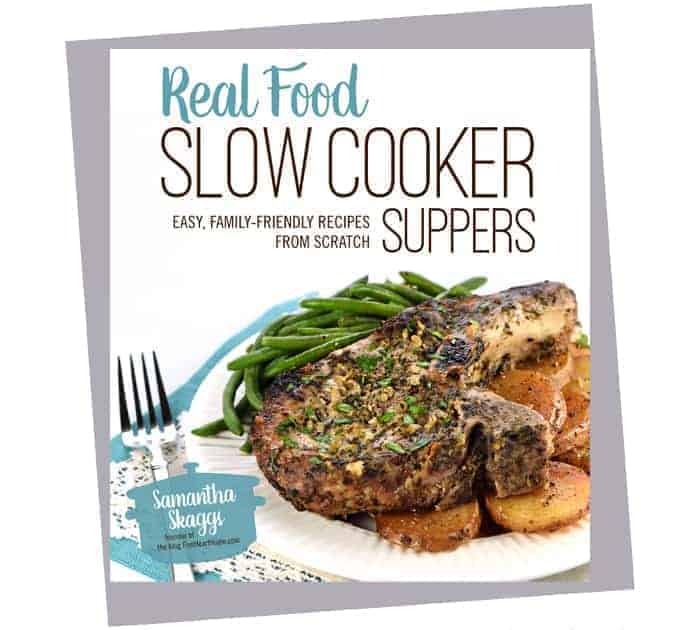 I’ve already shared that I’m currently working on a slow cooker cookbook, but it involves solely dinner recipes. 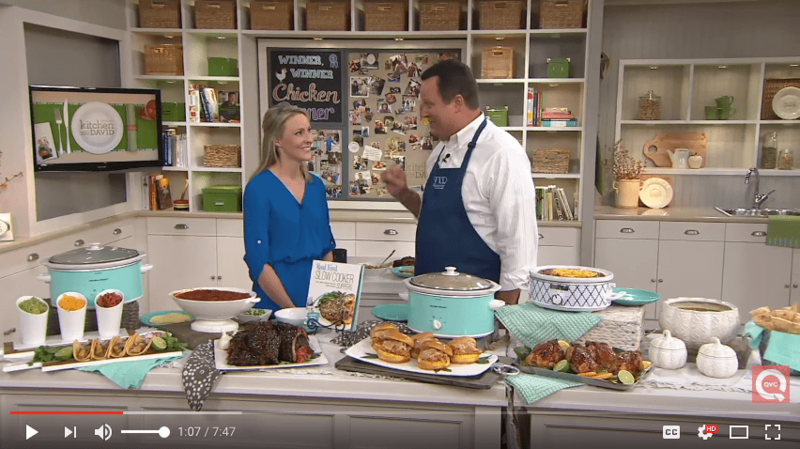 Nonetheless, I’m apparently in 24/7 crock pot mode, because more than one recipe I’ve posted to the blog in the past few weeks has been slow cooker-centered as well (albeit breakfast and side dish recipes). 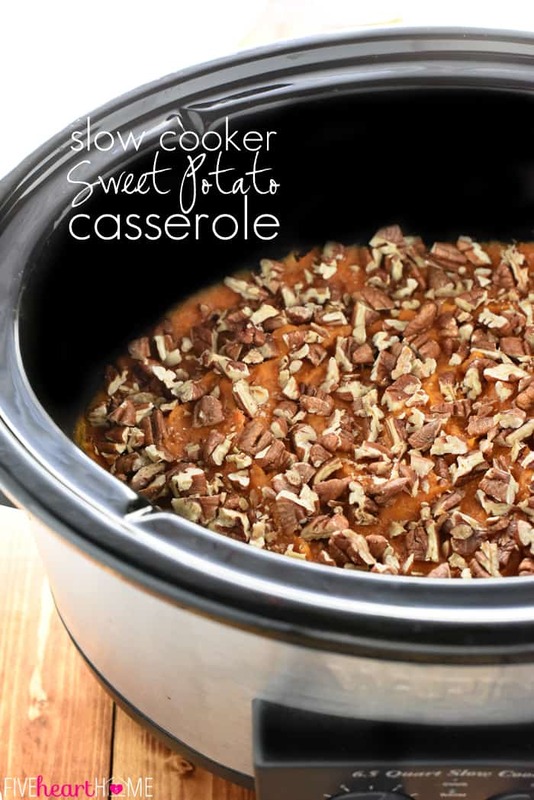 Today I have yet another crock pot side dish that would be perfect for Thanksgiving…Slow Cooker Sweet Potato Casserole! Mind you, it’s not technically a casserole, seeing as how it never bakes in the oven. 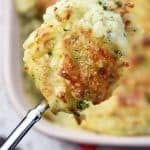 But it mimics a casserole in that tasty ingredients are stirred into mashed sweet potatoes in order to add flavor and a tad of richness…and then the whole shebang is topped off with crunchy toasted pecans, all casserole-like. The resulting side dish is effortless to make, relatively healthy, and yum, yum, YUM! I didn’t frou-frou up this recipe too much because I wanted the flavor of the sweet potatoes to shine through. I simply peeled 4 pounds of sweet potatoes, cut them into big chunks, and then slow cooked them until tender along with a bit of water. Next I drained off the liquid and used a potato masher to mash them right in the crock pot. I also mashed in some milk and butter (the latter of which you could technically leave out, but it does add a touch of creaminess and decadence without going overboard on the calories), stirred in enough maple syrup to complement the natural sweetness of the sweet potatoes without overshadowing it, and seasoned with a little bit of cinnamon, nutmeg, and ginger…again, not enough to overpower the star ingredient. Then I topped with chopped toasted pecans and allowed everything to heat back up for a few more minutes before serving. You can toast your pecans well in advance, so that there’s no conflict when the oven is over-booked on Turkey Day. 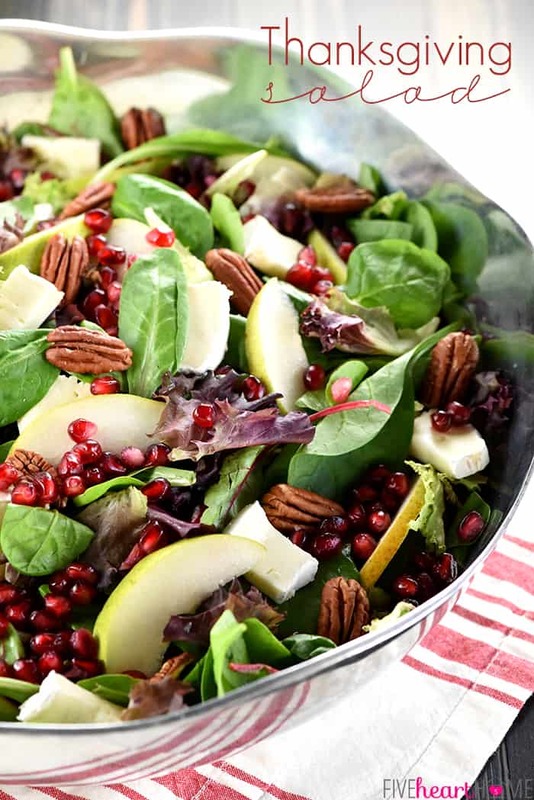 You can also top with candied pecans if you care to add a little extra pizzazz. Alternatively, you can sprinkle your mashed sweet potatoes with marshmallows and use a kitchen torch to toast them. I ask you, who wouldn’t love to be assigned that job on Thanksgiving? 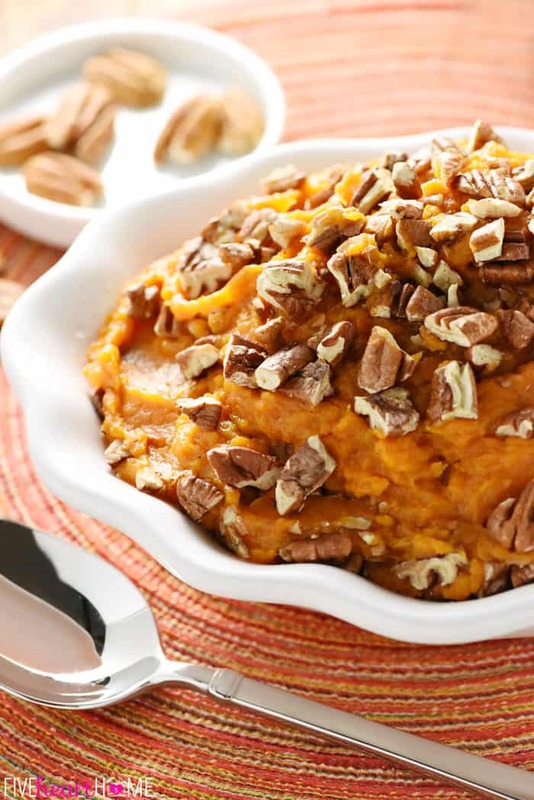 Once your sweet potatoes are ready, you can either set the slow cooker to warm until serving or transfer all of that goodness to a pretty serving dish (you might consider adding the pecans after the transfer, if that’s the case). 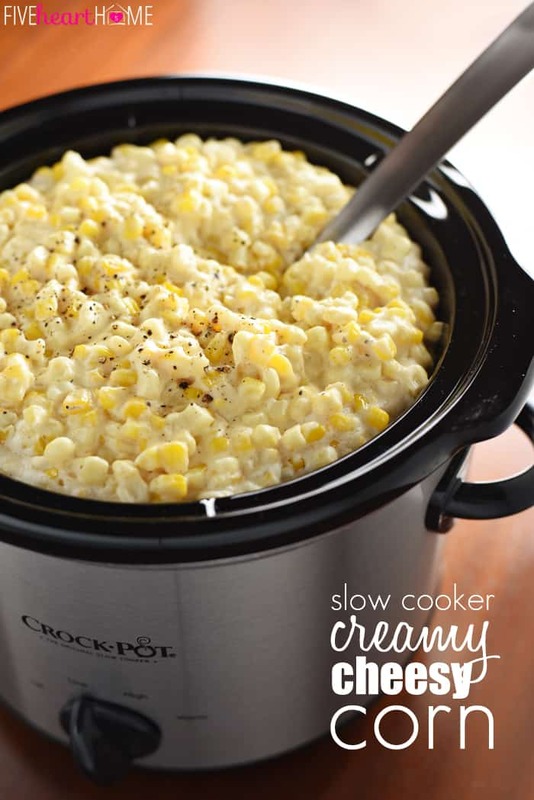 And that’s it…a delicious side dish effortlessly prepared in the crock pot! Yep, Slow Cooker Sweet Potato Casserole might be a new addition to your holiday menu this year, but after that, it’s guaranteed to shift over to the “family tradition” side of things. 😉 Enjoy! And I hope you enjoy the video below…Slow Cooker Sweet Potato Casserole really is this effortless to make! 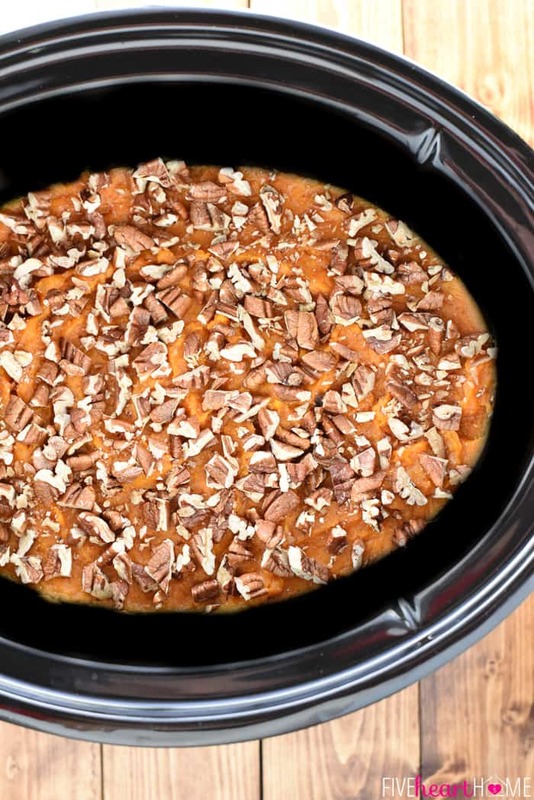 Slow Cooker Sweet Potato Casserole is lightly sweetened with maple syrup and topped with toasted pecans, making it a delicious and effortless addition to Thanksgiving dinner, while freeing up the oven at the same time! 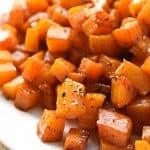 Place sweet potato chunks in the bottom of a large (5 1/2- to 7-quart) slow cooker; pour in water. Cover and cook for 6 to 7 hours on LOW (or 3 to 4 hours on HIGH) or until tender. 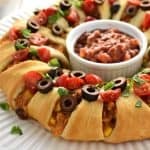 Drain water from slow cooker. 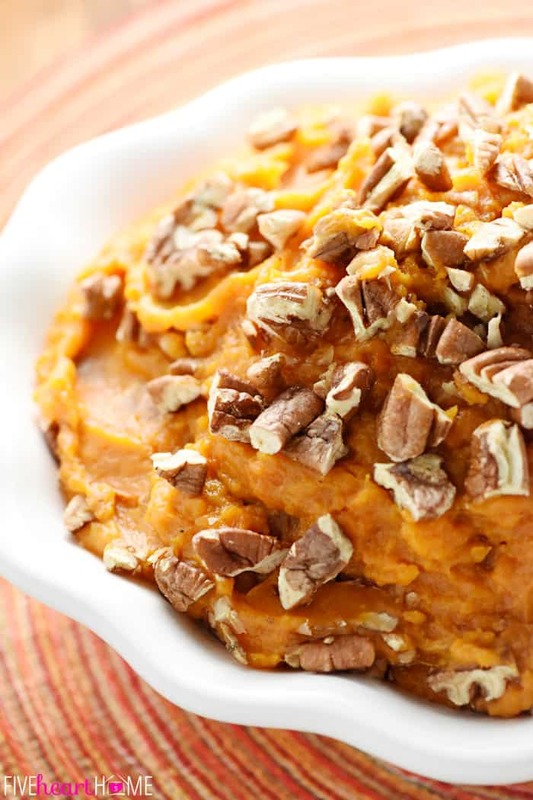 Using a potato masher, mash the sweet potatoes right in the slow cooker. Stir in milk, butter, maple syrup, lemon juice, vanilla, salt, cinnamon, nutmeg, and ginger. Smooth surface of sweet potatoes and evenly sprinkle with toasted pecans. Cover and cook for 15 to 30 more minutes until heated through. Sweet Potato Casserole may be served straight out of the slow cooker (set to WARM) or transferred to a serving dish. 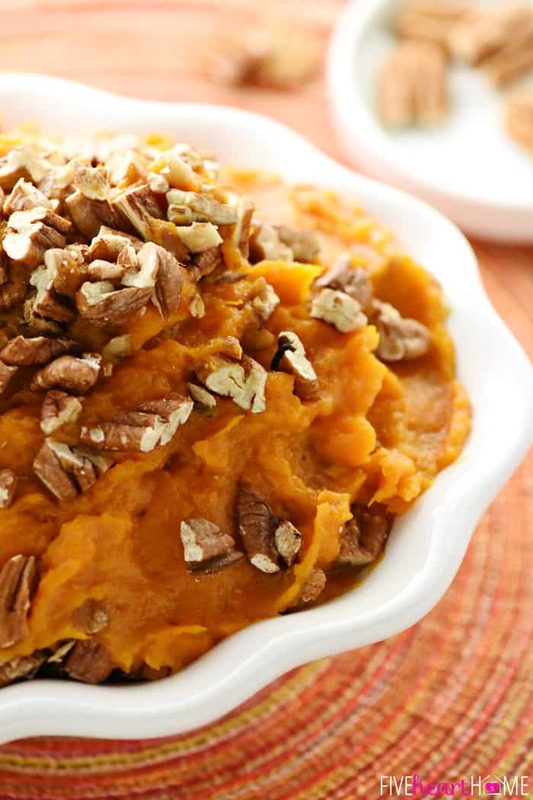 If using a serving dish, sprinkle the pecans on top after transferring the mashed sweet potatoes. To toast pecans, preheat oven to 350°. Spread chopped pecans on sheet pan and bake for 7 to 10 minutes or until lightly toasted, watching carefully to prevent burning. Candied pecans may be used in lieu of toasted pecans. Alternatively, you may sprinkle sweet potatoes with marshmallows and toast with a kitchen torch. Sweet Potatoes were awesome. I did make this vegan as I have a daughter who is allergic to dairy. I used vanilla almond milk and some Trans fat free margarine to replace those ingredients. Very good recipe. Hi Casey! Sure, a little extra brown sugar never hurt anything! 😉 If you prefer a sweet pecan topping, you could also chop up candied pecans instead of regular toasted ones. Enjoy! Sounds like a wonderful recipe. However, the AARP ad hides the directions. I couldn’t make it go away. Hi Connie! I’m so sorry…that definitely shouldn’t be the case! If an ad shows up in the recipe, it should be next to the text, not over it. I’ll report this to the company that manages my ads, so I appreciate you letting me know. In the meantime, if you want to view the recipe without the ad, hit the PRINT button in the top right corner of the recipe. You don’t actually have to print it out from there, but that should take you to a view of the recipe where the ad is removed. Hope that helps and I apologize again for any inconvenience! 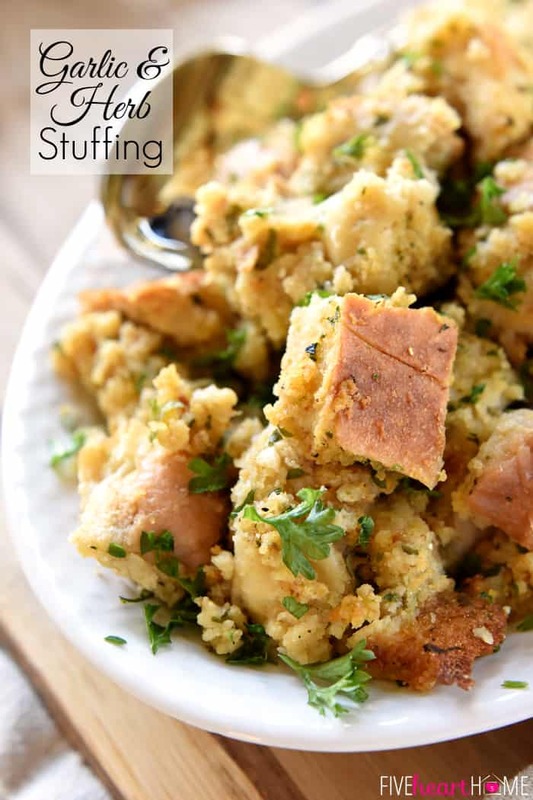 I’m planning on serving this dish at my Friendsgiving this year. Can you cut the sweet potatoes the night before? I’m trying to cut down the amount of prep time before work the day of. Thanks! Yes, you should be able to peel and cut your sweet potatoes the night before, Sarah! Just submerge them in cold water after you peel/cut them and pop them in the fridge overnight to prevent browning. When you’re ready to assemble the recipe, drain the sweet potatoes well before proceeding. I have a 6 quart Slow Cooker. If I multiply this recipe by 1.25-1.5x will it fit? I want to maximize how much I’m making based on the size of the cooker. Thanks!